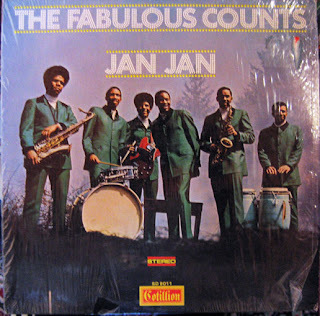 "Detroit funk unit the Fabulous Counts formed in 1968, uniting keyboardist Mose Davis, guitarist Leroy Emanuel, alto saxophonist Demo Cates, tenor saxophonist Jim White, and drummer Raoul Keith Mangrum. Earning local notice as both headliners and a jack-of-all-trades backing band for national touring acts, the group eventually teamed with noted producer Richard "Popcorn" Wylie, recording the cult classic "Jan, Jan" for the Motor City label Moira in late 1968. Distinguished by Davis' banshee-wail Hammond organ, and the dueling saxophones of White and Cates, the instrumental fell just shy of the national R&B Top 40 charts in early 1969. Noted for its scorching White solo, the Fabulous Counts' sophomore effort, "Dirty Red," further solidified their edgy urban funk sound, although commercial interest was negligible. The group's third single, "Get Down People," proved their biggest hit -- complete with vocals, conga drums, and a deeply soulful Emanuel guitar solo; it spent nine weeks on the R&B charts in 1970 and highlighted the Fabulous Counts' lone LP, Jan, Jan, produced by Detroit legend Ollie McLaughlin and issued on Cotillion. They left the label the following year for local imprint Westbound, swapping out a few members and continuing as simply the Counts." I just found your blog within the last week and I totally love it. I've shared it with all my friends on Facebook. I just hope you're not throwing in the towel. It's been 9 days since this post so I'm a little worried. Please, keep fighting the power and keep the funk coming. Thanks a lot, Jonman)) I'll try to keep the funk coming. Sorry, but some of the information here isn't correct. Andrew Gibson was the original drummer for The Fabulous Counts. "Gibby" Gibson was a fixture in drumming circles around The D in the 60's through the 2000's. That's Andy behind those drums in that photo. yea good music. But sorry, how can i save album.